Still Eating Epcot – Round 2 | It's "All in WDW"
Look at them funnel cakes! Wow! 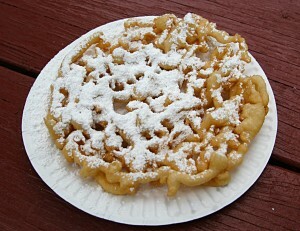 Two little stories … first, our family’s favorite Epcot funnel cake story happened many years ago when our son was young. We were walking around the World Showcase promenade. As, we passed the funnel cake “hut” – you know the one – we fell under the spell of the heavenly scent of deep-fried waffle dough. … temptation to add ice cream. Imagine that waffle covered completely over with the biggest, thickest slab of vanilla ice cream imaginable. Oh, I wish I had a picture! It was heavenly! The second story is really short. As Mrs. All in WDW and I took that same stroll a week ago, I snapped this picture of the kiosk. “Why do you need that,” she asked. I told her that I had a Quick Service poll upcoming and I might need the shot. We love our funnel cakes! It nearly ‘took out’ the U.K. fish shop! The “refreshment port” near Canada has much more appeal than I expected. It missed the Top 8 by two measly votes. We do not like Electric Umbrella. When I seeded the “tourney”, I thought that its group of three options would be very evenly split and yield ‘the umbrella’ and Norwegian bakery as its winners. I guess I really underestimated La Cantina. It easily won the three-way showdown. China, Germany, and Japan have some work to do as, first, China’s Lotus Blossom and Germany’s Sommerfest got very meager support. At the same time, Japan’s brand-new offering – Katsura Grill – just barely snuck into the second round. Poor Morocco. It is still so misunderstood. Tangierine Café never had a chance, I guess. OK, my friends! Let’s move on. It’s the Top 8, and the Top 2 in each group reach the finals. Which ones of these are our favorite choices when it comes to Epcot quick service dining? !